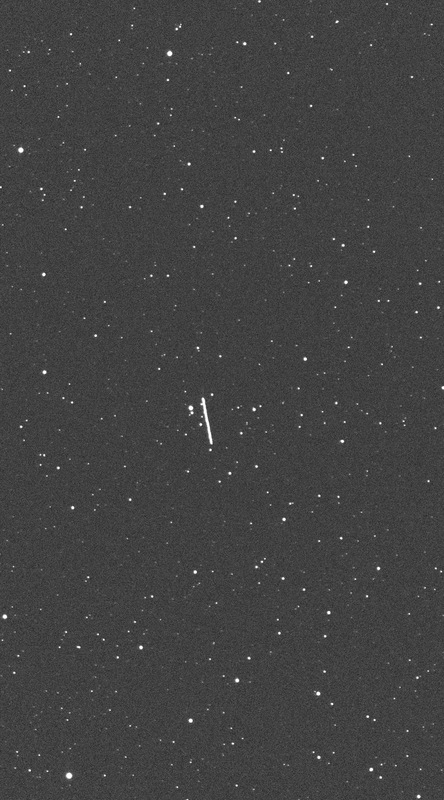 Asteroid 2012 DA14 had a close approach with Earth at 1925 UT on 2013 Feb. 15. at about 0.09 LD (Lunar Distances = ~384,000 kilometers) or 0.0002 AU (1 AU = ~150 million kilometers). 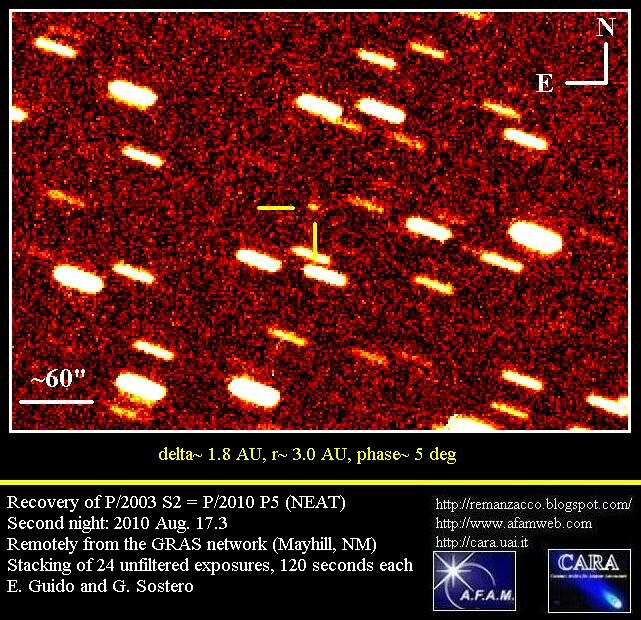 For more info about this asteroid and its close approach see our previous post. Below you can find a selection (in chronological order) of our images & animations taken before, during and after the close approach. Image of 2012 DA14 taken remotely from Australia on February 15, 2013 at 17:40UT. Exposure time 5 seconds with a 0.50-m f/6.8 astrograph + CCD + f/4.5 focal reducer from Q62 (iTelescope Observatory, Siding Spring). The asteroid was then of magnitude ~9.5 and moving at ~1140 "/min and less than 2 hours before its close approach of 19:25UT. Click on the image for a bigger version. Below you can see a short animation made by using 3x5-second exposures. Click on the thumbnail for a bigger version. Image taken remotely from Australia on February 15, 2013 at 18:45UT, just 40 minutes before the close approach. Exposure time 60 seconds with a 0.1m f/5.0 Astrograph + CCD from Q62 (iTelescope Observatory, Siding Spring). The asteroid was then of magnitude ~7.6 and moving at ~2665 "/min. 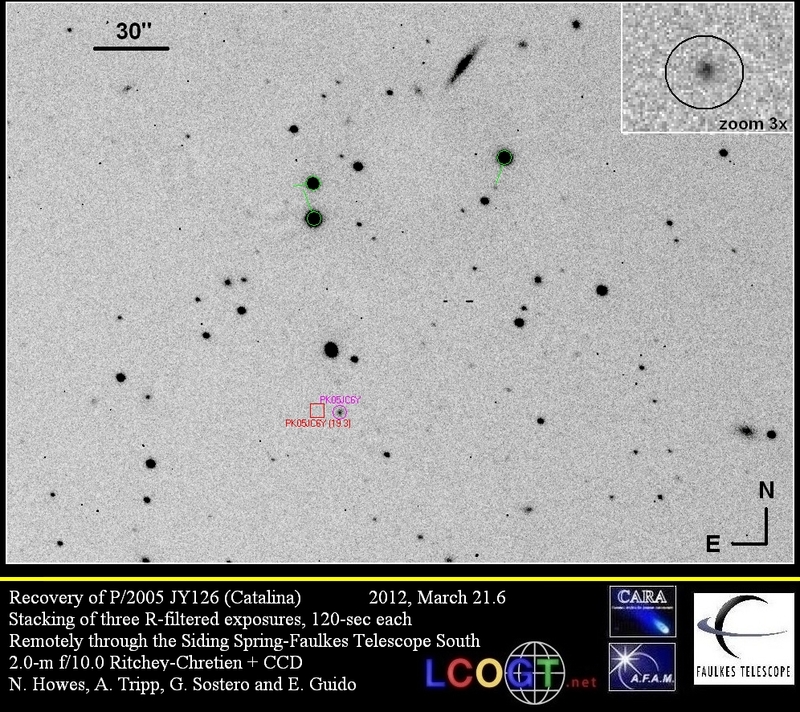 Image taken from Remanzacco Observatory in Italy (mpc code 473) on February 15, 2013 at 20:54UT. Exposure time 20 seconds. The asteroid was then of magnitude ~8.2 and moving at ~1513 "/min. 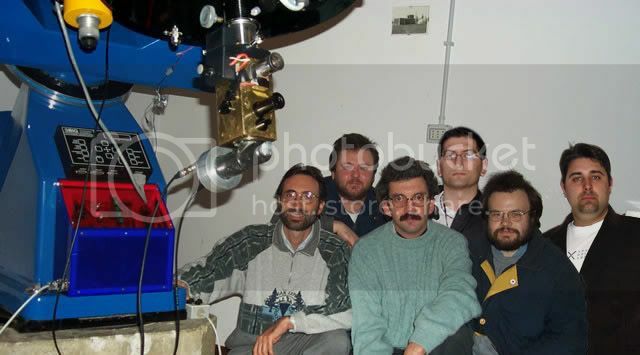 Observers L. Donato; D. Lasaponara; G. Pasqualin; V. Santini; M. Travagini. 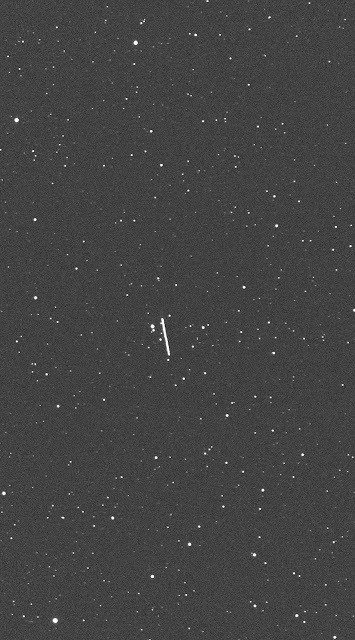 Image taken remotely from Spain on February 15, 2013 at 22:31UT, 3 hours after the close approach. Exposure time 60 seconds with a 0.15-m f/7.3 refractor + CCD from I89 (iTelescope Observatory, Nerpio, Spain). The asteroid was then of magnitude ~9.9 and moving at ~525 "/min. Click on the image for a bigger version. Below you can see a short animation made by using 2x60-second exposures. Click on the thumbnail for a bigger version. Image taken remotely from New Mexico on February 16, 2013 at 11:47UT, roughly 16 hours after the close approach. Exposure time 10 seconds with a 0.50-m f/6.8 astrograph + CCD + f/4.5 focal reducer from H06 (iTelescope Observatory, New Mexico). The asteroid was then of magnitude ~9.9 and moving at ~525 "/min. Click on the image for a bigger version. Below you can see a short animation made by using 14x10-second exposures. Click on the thumbnail for a bigger version. 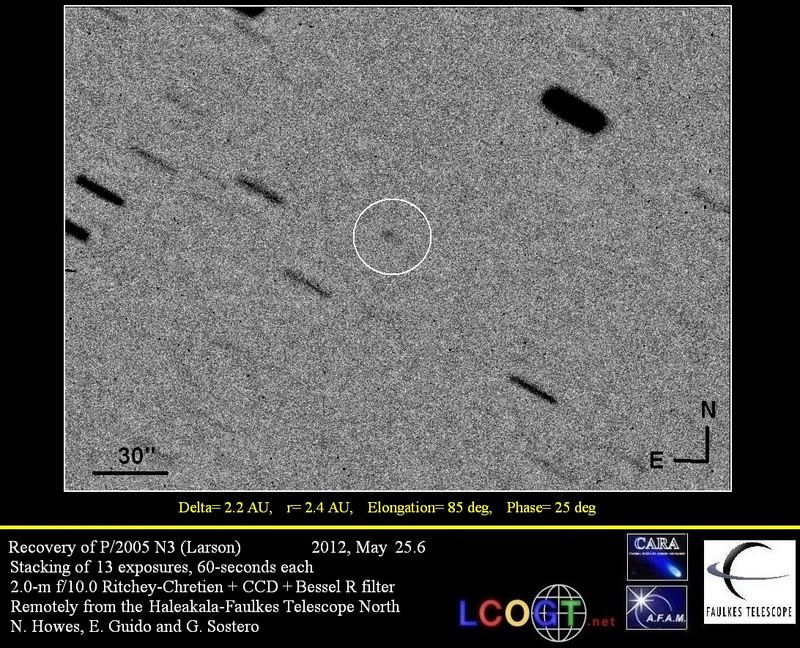 Asteroid 2012 DA14 was discovered by J75 OAM Observatory, La Sagra on images taken on February 23.03, 2012 with a 0.45-m f/2.8 reflector + CCD. 2012 DA14 has an estimated size of 40 m - 90 m (based on the object's absolute magnitude H=24.09) and it will have a close approach with Earth at about 0.09 LD (Lunar Distances = ~384,000 kilometers) or 0.0002 AU (1 AU = ~150 million kilometers) at 1925 UT on 2013 Feb. 15. 2012 DA14 will pass only ~ 27,700 km (17,200 mi) above the Earth's surface, that is only 0.09 lunar distances or 5.4 Earth radii from the center of the Earth. So close that it will pass inside the ring of geosynchronous weather and communications satellites (located about 35,800 kilometers (22,200 miles) above the equator, but still well above the vast majority of satellites, including the International Space Station). Due to the extremely close approach, this object will be a very strong radar target at Goldstone where observations are scheduled on 2013 Feb. 16, 18, 19, and 20. Radar images should provide constraints on the size, shape, and rotation state of the object. This asteroid will reach the peak magnitude ~7 on February 15 around 1930 UT and it will be brighter than 9th magnitude for approximately 3 hours (18h00-21h30 UTC). 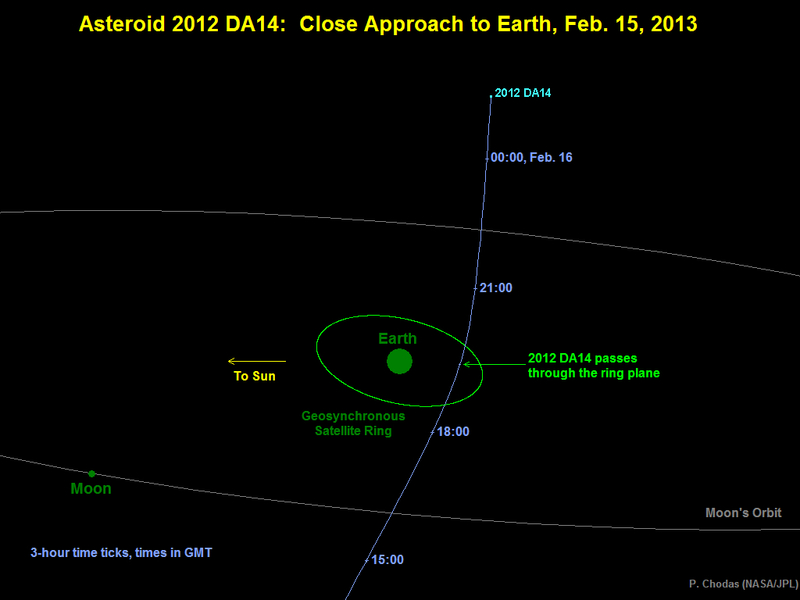 At the moment of the close approach 2012 DA14 will move at ~ 2800"/min (slightly less that 1 degree per minute). This means it will need only 40 seconds to move the apparent diameter of the Moon. While it will be too faint to be seen with the naked eye, 2012 DA14 will be easily visible with a good set of binoculars or a small telescope. It will rise above the horizon in the constellation Virgo, after that it will move in the direction of the north celestial pole, reaching about 10th magnitude approximately two hours later in the Little Dipper. In the morning hours of February 16, it will have crossed half of the sky, moving slowly close to the Pole Star at a magnitude of 13. Below you can see an animation (10-minute steps) showing the path of 2012 DA14 from 21:00 UT of Feb. 15 to 02:00 UT of Feb. 16 (calculated for Rome, Italy). Next to the asteroid designation, you can see the expected magnitude value. Click on the animation for a bigger version. The animated gif below made by Geert Barentsen indicate (green areas) parts of the world where the asteroid will be above (and the Sun below) the horizon during the period of its maximum brigthness (18h00-21h30 UTC of Feb. 15). Observers in Australia, Asia and Europe will be best placed. Click on the animation for a bigger version. 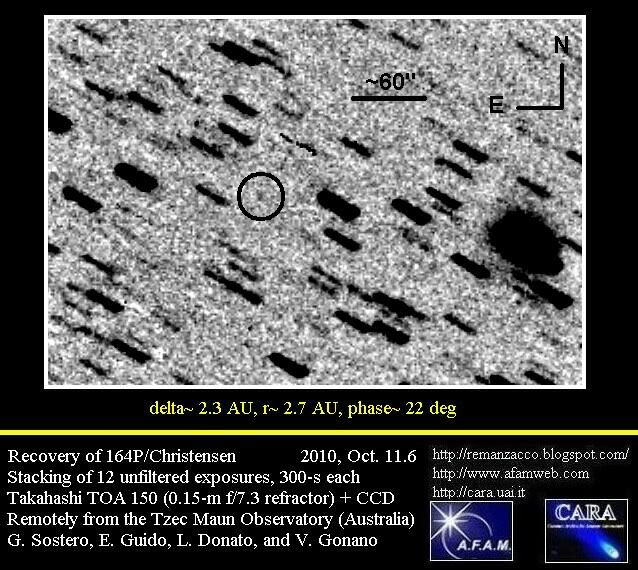 While there is no cause for concern ( 2012 DA14 will NOT impact Earth), this is one of the closest approaches recorded and the record close approach for a known object of this size. The table below shows the top 20 closest approaches by NEOs (Near-Earth Objects) sorted by nominal distance (click on the image for a bigger version). While the table below shows the top 20 closest approaches by NEOs (Near-Earth Objects) sorted by nominal distance + absolute magnitude H < =26. (click on the image for a bigger version). According to JPL website "on average, we expect an object of this size to get this close to the Earth about once every 40 years. An actual Earth collision by an object of this size would be expected much less frequently, about once every 1200 years on average". 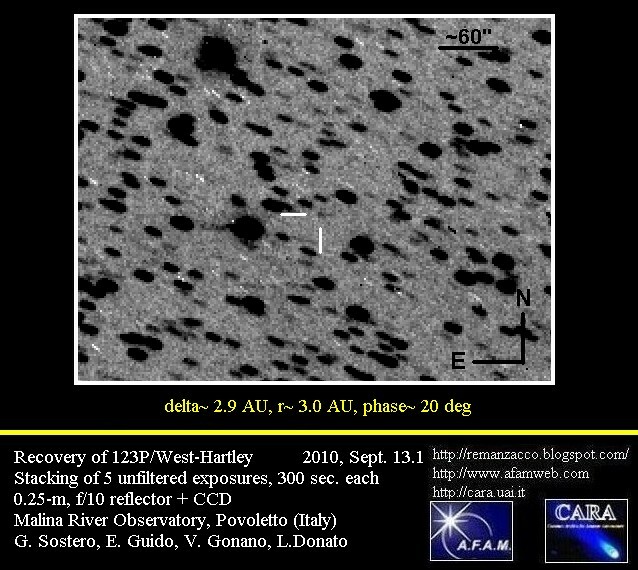 We plan to image 2012 DA14 during its close approach so stay tuned! 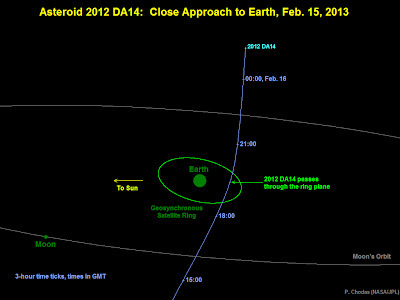 Below you can see a short animation showing the motion of asteroid 2012 DA14 on Feb. 14, 2013 at around 11:06UT. The asteroid was moving at ~1.15 "/min and its magnitude was ~17. The animation has been assembled using 3 images taken with Faulkes Telescope South 2.0-m f/10.0 Ritchey-Chretien + CCD operated by Las Cumbres Observatory Global Telescope Network by E. Gomez. 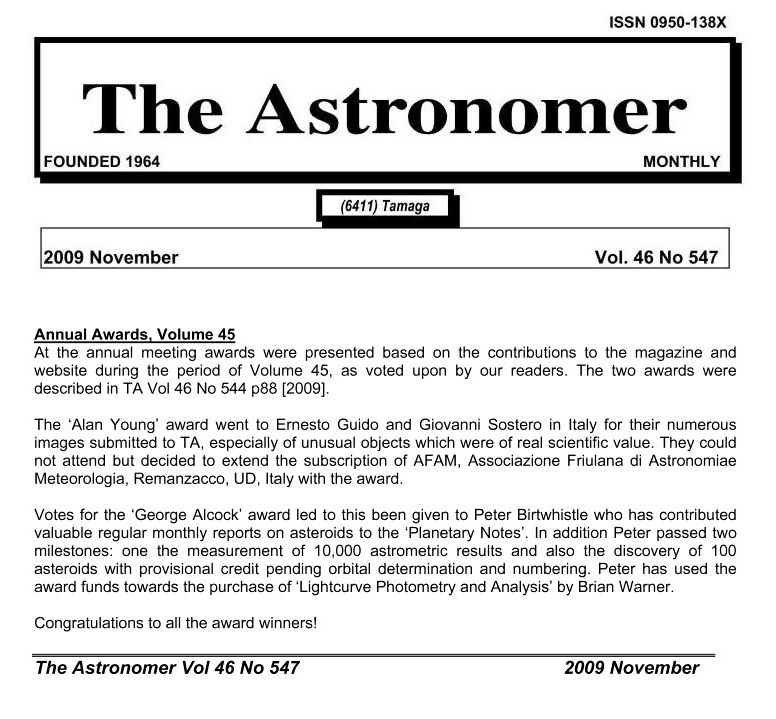 Animation by Remanzacco Observatory. Click here or on the animation for a bigger version. Apparently, at about 09:30 local time, a very big meteor burned up over Chelyabinsk, a city in Russia just east of the Ural mountains, and about 1500 kilometers east of Moscow. A pretty big sonic boom from the fireball, which set off car alarms and shattered windows. There are reports of many people injured (by shattered glass blown out by the shock wave). According to ESA experts there is NO link between Russia event & asteroid 2012 DA14 close approach. Here you can see preliminary calculations showing how the 2 events are unrelated. We have been able to image 2012 DA14 remotely from Australia on February 15, 2013 at 17:40UT. 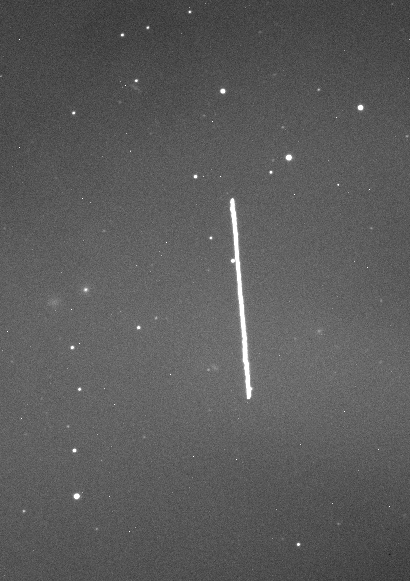 Exposure time 5 seconds with a 0.50-m f/6.8 astrograph + CCD + f/4.5 focal reducer from Q62 (iTelescope Observatory, Siding Spring). The asteroid was then of magnitude ~9.5 and moving at ~1140 "/min and less than 2 hours before its close approach of 19:25UT. Click on the image for a bigger version. New image we have obtained remotely from Australia on February 15, 2013 at 18:45UT, just 40 minutes before the close approach. Exposure time 60 seconds with a 0.1m f/5.0 Astrograph + CCD from Q62 (iTelescope Observatory, Siding Spring). The asteroid was then of magnitude ~7.6 and moving at ~2665 "/min. You can find here a selection (in chronological order) of our images & animations taken before, during and after the close approach. 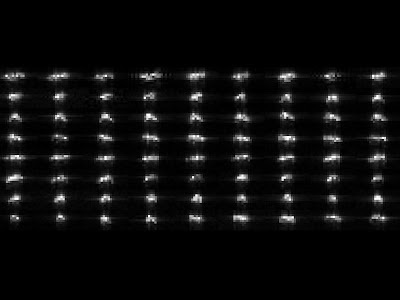 An initial sequence of radar images of asteroid 2012 DA14 was obtained on the night of Feb. 15/16, 2013, by NASA scientists using the 230-foot (70-meter) Deep Space Network antenna at Goldstone, Calif. Each of the 72 frames required 320 seconds of data collection by the Goldstone radar. The observations were made as the asteroid was moving away from Earth. The asteroid's distance from the radar dish increased from 74,000 miles (120,000 kilometers) to 195,000 miles (314,000 kilometers). 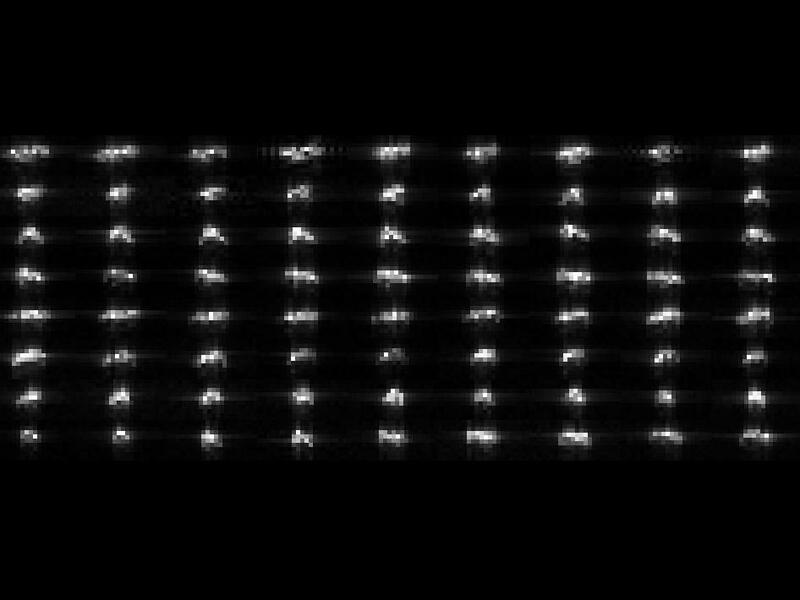 The resolution is 13 feet (four meters) per pixel. The images span close to eight hours and clearly show an elongated object undergoing roughly one full rotation. M.P.E.C. 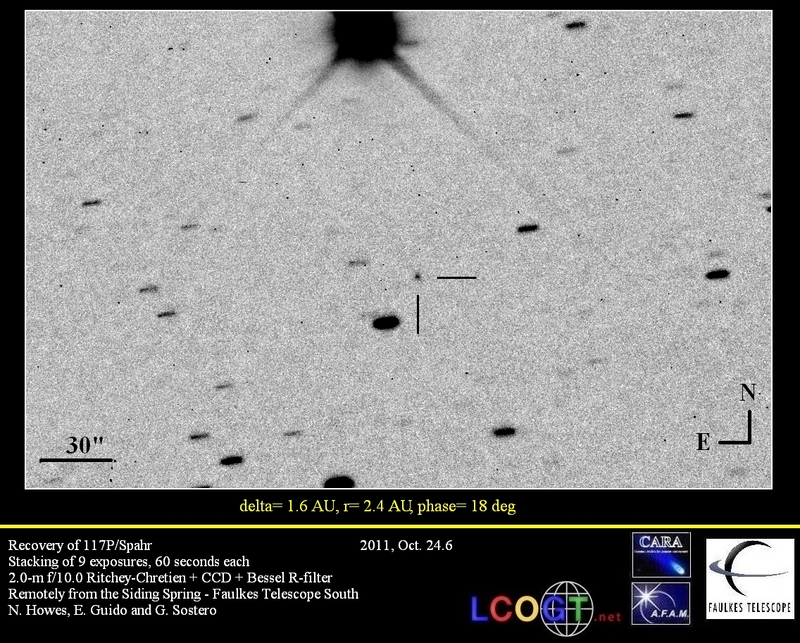 2013-C24, issued on 2013 Feb. 6, reports the discovery of the asteroid 2013 CL22 (discovery magnitude 16.7) by J75 OAM Observatory, La Sagra on images taken on February 05.06 with a 0.45-m f/2.8 reflector + CCD. 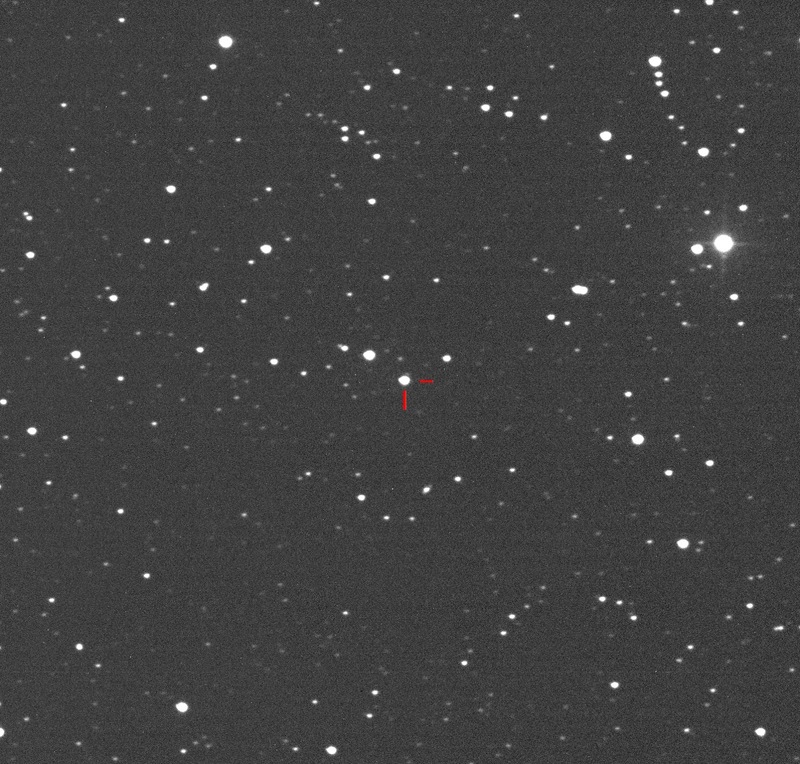 2013 CL22 has an estimated size of 30 m - 68 m (based on the object's absolute magnitude H=24.7) and it had a close approach with Earth at about 1.2 LD (Lunar Distances = ~384,000 kilometers) or 0.0031 AU (1 AU = ~150 million kilometers) at 0743 UT on 2013 Feb. 02. This asteroid reached the peak magnitude ~13.1 on February 02 around 1600 UT. We performed some follow-up measurements of this object, from the H06 ITelescope network (near Mayhill, NM) on 2013, Feb. 05.4, through a 0.51-m f/6.9 reflector + CCD. 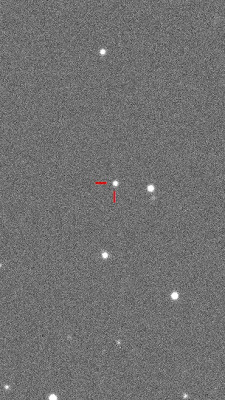 Below you can see our image, stack of 15x15-second exposure, taken with the asteroid at magnitude ~16.9 and moving at ~6.07 "/min. At the moment of the close approach 2013 CL22 was moving at ~ 259"/min. Click on the image below to see a bigger version. 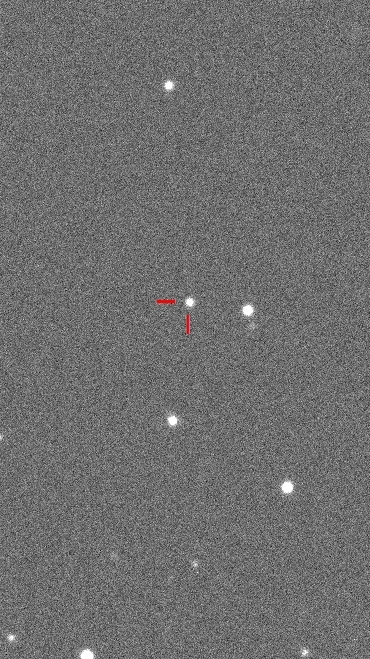 Following the posting on the Central Bureau's Transient Object Confirmation Page about a possible Nova in Cep (TOCP Designation: PNV J23080471+6046521) we performed some follow-up of this object remotely through the 0.43-m f/6.8 reflector + CCD of ITelescope network (MPC Code I89 - Nerpio, Spain). 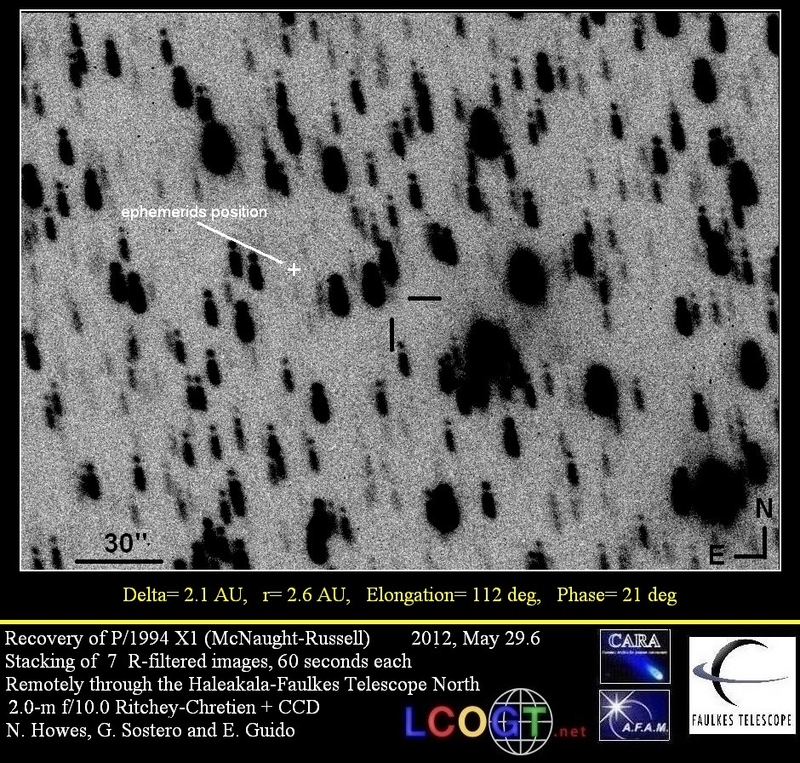 (equinox 2000.0; USNO-B1.0 catalogue reference stars). Kazuyoshi Imamura (Okayama Univ. of Sci. 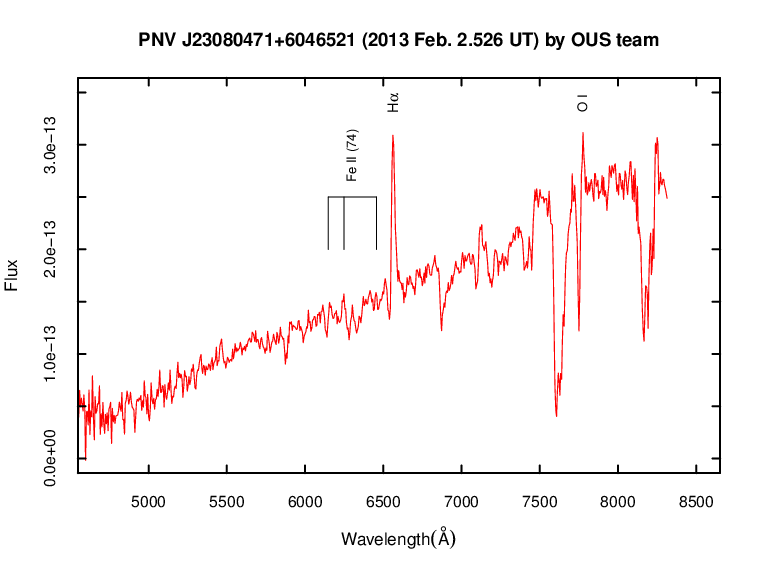 team, JAPAN) reports on vsnet-alert mailing list that they "succeeded in obtaining a low-resolution spectrum (R~400) of the PNV J23080471+6046521 (in Cep) on February 2.526 UT at the OUS (Okayama Univ. of Sci.) 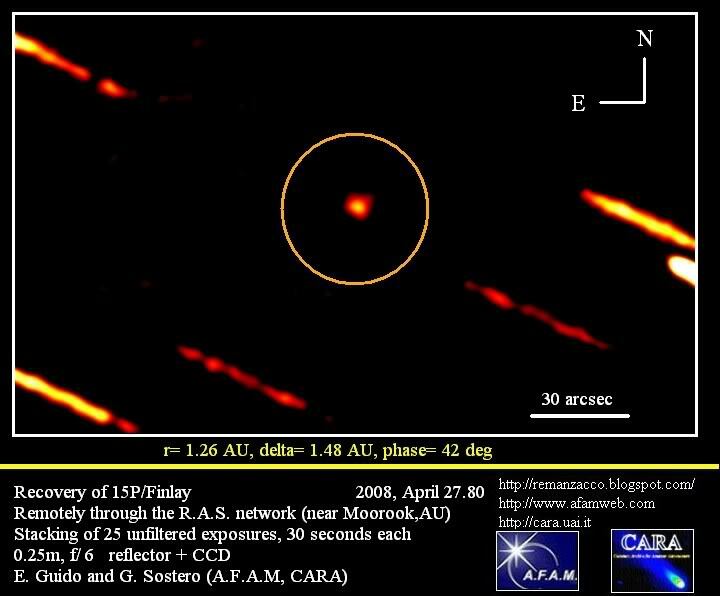 observatory......From our result, this object is thought to be a classical nova (Fe II class)"
According to Cbet No. 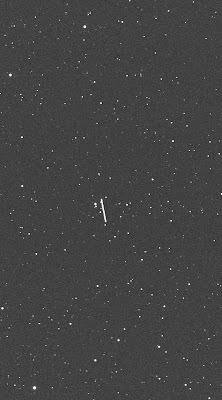 3397, PNV J23080471+6046521 is now NOVA CEPHEI 2013. This nova has been discovered by Koichi Nishiyama and Fujio Kabashima (Japan) on two 40-s unfiltered CCD frames (limiting magnitude 13.5) taken around Feb. 2.4119 UT using a 105-mm f/4 camera lens (+ SBIG STL6303E camera). 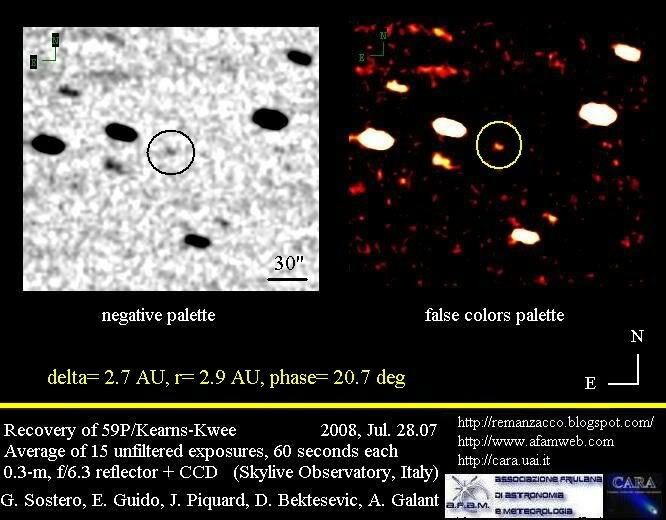 Spectra confirming the nature of the nova have been obtained by K. Imamura (see above) and M. Fujii (Bisei Astronomical Observatory).